Be sure to socialize your puppy early and often. Early socialization to people, puppies, dogs, cats, multiple floor and ground substrates, novel objects, noises, and various environments will maximize the probability that your future adult dog will become a happy and welcome member of the community. However, please note that not all socialization is productive socialization. Especially during the Fear Imprint Period, which most ethologists believe is between weeks 8 – 10 and possibly 8 – 12 of the puppy’s life, be careful to expose your puppy only to situations that will be safe and enjoyable. There is also a Second Fear Imprint Period that may occur within or throughout the 6th through 14th month of your dog’s life. Continue frequent socialization during this period. However, recognize that during this stage any unpleasant events may create permanent negative imprints. Therefore, manage your dog’s socialization to ensure that it is productive and pleasant. CPT incorporates the above philosophies when designing the lesson plan for the CCI Puppy Raiser Class. 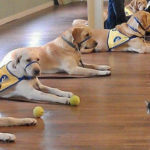 In the photo you see a group of CCI puppies becoming familiar with one another, people, and kittens, as they may one day inhabit a multi-species house that includes a kitten or adult cat.